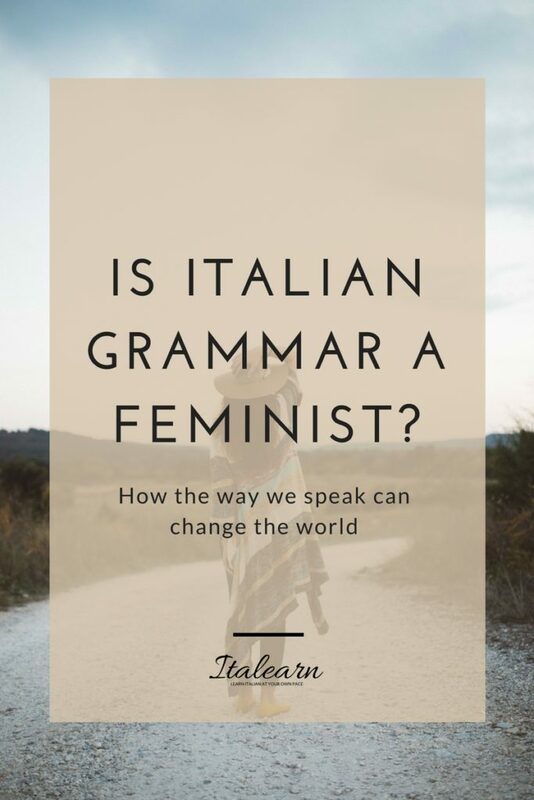 IS ITALIAN GRAMMAR A FEMINIST? Language is powerful, we all know that. How we use it is a personal choice, but it can have repercussions in other people’s lives. There has been a lot of talking lately, especially in the last few months, around the issue of feminine words that designate jobs and careers. Why is this topic so interesting and controversial at the same time? Because it reflects how we interact as human beings and political subjects. This is a very good example of how language shapes who we are as people and how the way we choose to communicate affects relationships and changes society’s habits in the long term. 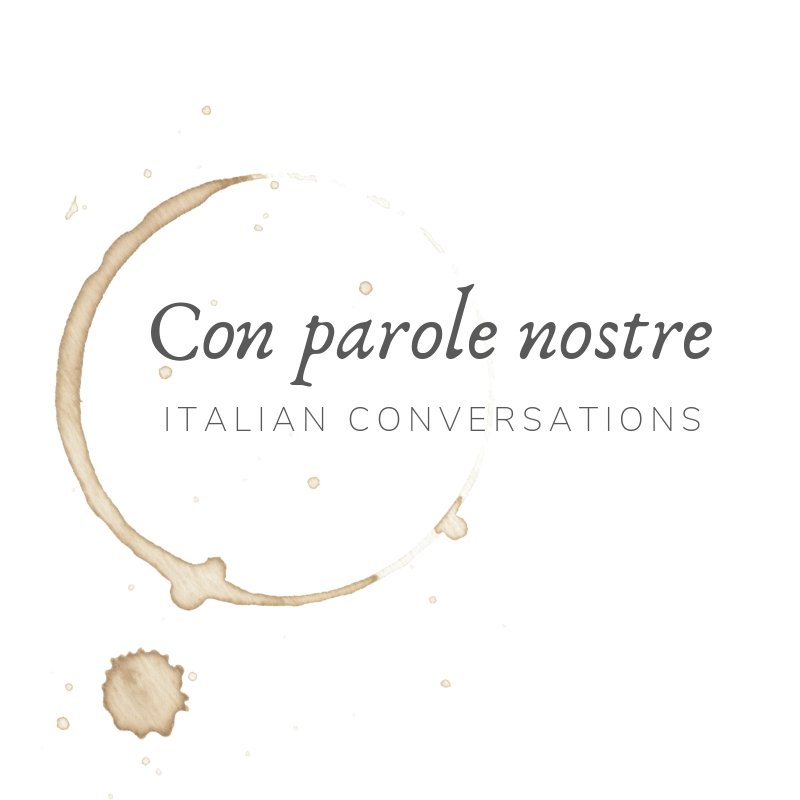 The debate in Italy has often been conducted on intensely hostile terms. Why all this public hatred? Because this is not just a linguistic issue, it involves politics and the life of women, especially those who have higher positions and find themselves in the public eye more often. From a social and historical point of view, the process of creating-adapting-using feminine career-words (totally made-up word, but it serves the purpose of this article) has always been long and difficult. To cut a long story short we could say that, because in the past there have rarely been women doing “men” jobs, we have never needed to use the nouns. Does this make sense to you? If your language does not have the distinction between masculine and feminine (like English), maybe this can be difficult to grasp at first. When did the debate originate? In the 1970s it was very popular among activists and feminists to use masculine nouns to describe their jobs because they saw it as a way to demonstrate their equality with men. Now, feminists, many teachers, and speakers of Italian think exactly the opposite. We won’t ever have a real equality if we continue to use only masculine nouns to indicate women. From those decades of social turmoil and renovation, the debate over the use of feminine career-nouns has always been very passionate (to put it mildly), but it got even more heated last December. Laura Boldrini, the President of the Italian Parliament, decided that all women working in the Parliament will be addressed with their feminine career-word. And this was the last straw. Men, especially those in higher power positions, are against this regulation, but surprisingly many women are also against it. Part of the women involved in this decision are openly against it because they see it as a useless and dangerous imposition. Choosing to make a simple distinction between feminine and masculine terms says more about us than just “being able to speak a language”, we are making a choice with every word we say. Respecting women, also through language, can have a strong impact on the way we perceive the women in our lives, and by extension all women. And, whether or not we have been surrounded by a language that has two genders, there comes a moment when we start reflecting on the language itself. 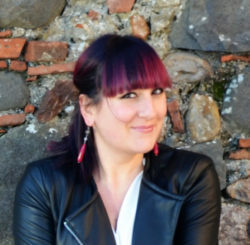 To fully understand how the Italian language works with regards to words creation, and consequently gender attribution, we need to go back to the ancient Latin and Greek origin of modern Italian and to the historical role of women in the Italian society. Italy has long been a patriarchal society, still today there are less women working – compared to men, and they are paid less on average. Even if our language provides for both genders, feminine career-words have always had a hard time being accepted and used. The resistance from men has been (and still is) very strong, to the point that the feminine of some career-words can no longer be used because it has acquired a ridiculing, mocking undertone. From a linguistic point of view, what happens is that many of these career-words, do have both genders, but the feminine is pretty much unknown, even to the vast majority of native speakers of Italian. 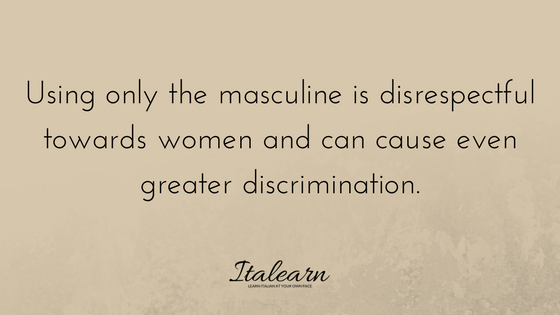 Italian is one of those languages with two genders: masculine and feminine. 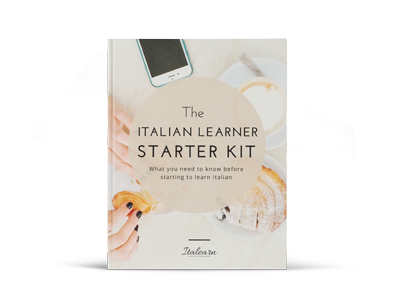 The Latin and Greek roots of Italian have developed into the language we have today – which continues to evolve, thanks to the millions of speakers who shape it from around the world. One of the first rules we are taught is that words that end in -a are feminine and words that end in -o are masculine. Which is true in many, many cases, but it’s just one side of the story. 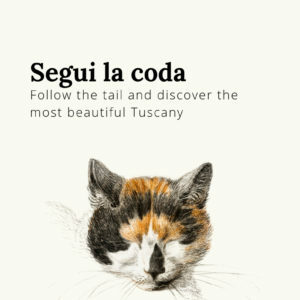 As happens very often with Italian, there are exceptions to the rule: there are words that can have both genders, words that take a gender but it does not correspond to the natural gender of the person it refers to, and there are words that are the opposite gender of what it looks like. 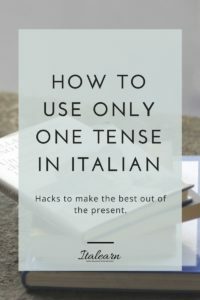 When you learn Italian, you also have to remember the gender of those words that have a different gender in your language – let’s take “the sun” and “the moon” as an example: in Italian we have “il sole”, masculine, and “la luna” feminine; but in German we have “die Sonne”, feminine, and “der Mond”, masculine. Another rule of Italian regarding genders: when we need to use a generic term in the plural, we use the masculine. 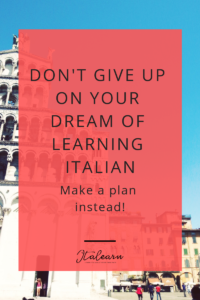 For new learners this can be difficult to manage at the beginning, you need to use your memory more with italian, sometimes it’s better to learn by heart, without asking too many questions, than trying to fit everything into a “one rule-fits-all” mindset. 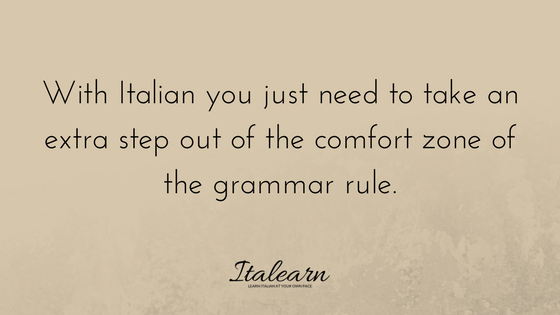 You just need to take an extra step out of the comfort zone of the grammar rule. 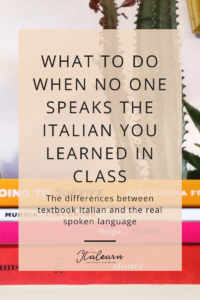 I have created a couple of cheat-sheets to help you memorize some of the more common exceptions in the definition of the gender of Italian nouns, you can find them in my free resources page. I’ll give you some examples of what’s included in the cheat-sheets. As we said before, the final letter of a word doesn’t always determine the gender, we need to consider a larger chunk, that’s the part that still has to do with Latin and Greek. The word giornalista, for instance, doesn’t just end in -a which may suggest the word is feminine, it does end in -ista which is a suffix that indicates the double gender, both feminine and masculine (this is just for the singular, because the plural is regular, -e for women and -i for men). Another example: words ending in -asta or -atra like ginnasta and pediatra, have both a double gender. The easiest way to identify the gender of a new word is to look at the article, or the context. Why are feminine career-words so strange? Everything we are used to, everything that sounds familiar, doesn’t scare us, we don’t even pay attention to that. 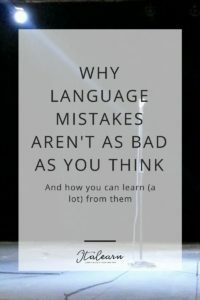 But when we take a leap into the unknown (which is no big deal for us language learners, because we always find something new to learn) we feel uncomfortable. Because we don’t want to abandon our old safe habits, and we have a certain resistance to admit that maybe we were wrong. That’s what is happening in Italy right now (well, in the last decade or so 🙂 ). We are struggling to use words that have always been there but we didn’t know existed. We are not used to the sound of those words, we are not sure how to use them. 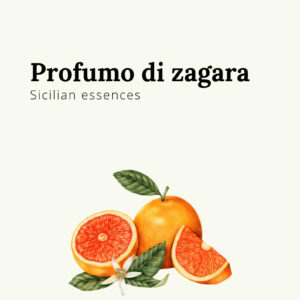 Words like sindaca (feminine of mayor), chirurga (feminine of surgeon), ministra (feminine of minister) sound like alien words to many Italians, yet these words exist and can be used. I know this can seem strange to English native speakers because you don’t make this distinction: the president means both a woman and a man; the mayor also can be referred to both men and women. In Italian the word mayor is sindaco. If you look it up in the dictionary, you will find that it is listed as a masculine noun and that there is a correspondent feminine version that ends in -a. This is a very simple thing to do when we have a doubt, we look it up in the dictionary. Yet most speakers don’t do that. There are people (like me) who use the existing, correct and fitting female version: la sindaca è arrivata. And yes, there is fourth group: those who like to mix it up and use all of the above in the same sentence! What does Ms Grammar say? Who is right and who is wrong? It’s hard to say without taking a side. 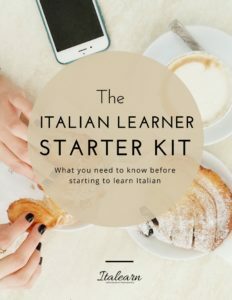 But we do have the Accademia della Crusca, the most important and ancient institution that knows it all about the Italian language and is the go-to resource for when you want to speak italian correctly. They do not dictate any rule from above, they just acknowledge the state of the language. So, what do they think about this gender issue? 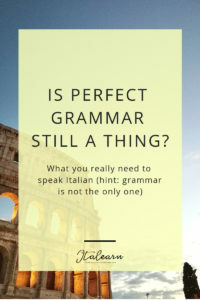 Their view is pretty clear: if there is a word in Italian, that is well settled in its historical time, it is ok to use it – even if it sounds strange. The main issue of using only the masculine is not just that it is not grammatically correct, it is disrespectful towards women and can cause even greater discrimination. 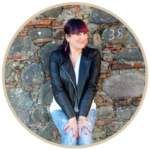 My position on the feminine career-nouns is this: when there is a feminine name it is perfectly ok to use it, even if it does not sound good or correct. I think it is respectful to use the proper feminine word when it is available (unless the woman I am talking to prefers otherwise). Using language respectfully leads to a more respectful community, it is just a small step that everyone can take. 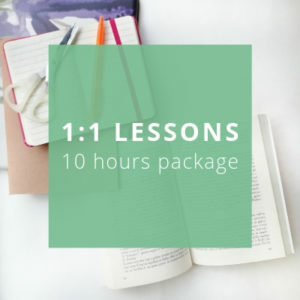 By improving our way of interacting in both our native language and a foreign language, we improve our relationships and grow a more positive mindset. 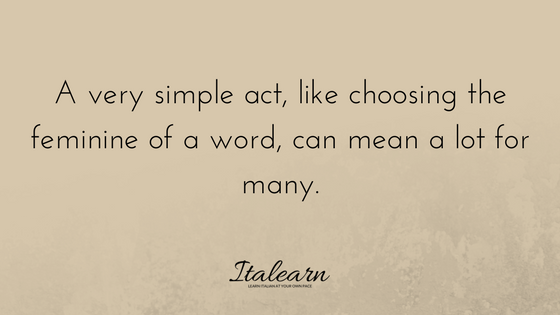 A very simple act, like choosing the feminine of a word can mean a lot to many.